At Holy Hen House we are passionate about getting women in the Word, encouraging women of all seasons to mentor one another, and spurring one another with Jesus' grace in our unique walks of faith. We never thought we would have items for sale when we first began but we are so excited to create more items that inspire you and help you draw near to our Lord. This Cyber Monday we will offer our BIGGEST SALE of the year! If you find value in our products and love a great discount - now is the time to shop at HHH. Check out our items on sale individually or have fun combining several in a bundle to make gifts for family or friends (even you!) this Christmas season! 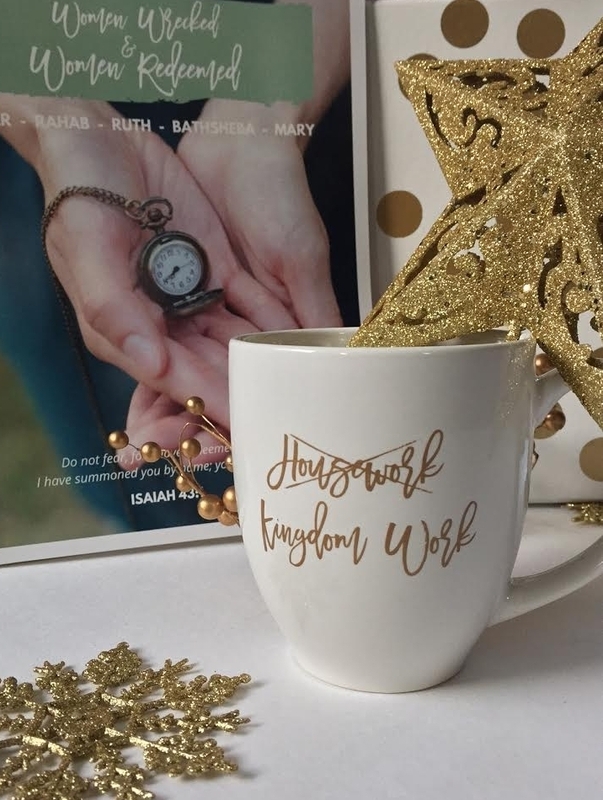 Our Kingdom Work Mug has been our most popular item in the shop. The to-do lists, the repetitive discipline, the unexpected mess to clean... these tasks throughout the day can get mundane. The message that the simplest act of serving one another in love and service is worship to Jesus is a welcomed daily reminder. It's not just housework - it's kingdom work! Our Women Wrecked + Women Redeemed Bible Study is great for Advent or Christmas as it looks at the five women who God purposed to bring Jesus into our world to save us. He used prostitutes, foreigners, and humble women to do great things for his glory! And now through Christ we can too! Walk In The Light Bible Study is a Bible study journal that goes through John's three letters - 1 John, 2 John & 3 John. In 1 day you read 1 chapter, answer 1 question, copy 1 passage, and write 1 prayer. The journal is intended for personal study but it can be used in a small group that may be looking for a brief Bible study. Perhaps between co-workers during a lunch break? Or friends that meet up weekly at a cafe? Cling Like a Burr is a six week Bible study and mini history lesson of Katie Luther's life. There's no question that the wife of the renowned Lutheran reformer, Martin Luther, was a unique and inspiring woman. Her dying words were, ""I shall cling to Christ as a burr clings to a coat." Read and discuss where she found hope and certainty in her life! Our Daughter of the King Shirt serves as a reminder that we have access to God the Father through his son Jesus Christ. Can you find the cross in the key? Wear during cooler weather and layer up on those chili nights with your favorite hoodie or flannel! These shirts are limited and once sold out are gone from our shop. Our Hen Shirt is our classic logo and a fun addition to any wardrobe! This tee has a loose "forgiving" fit and is super soft. This shirt is a standard in our shop.